Was This Winter Hard on Your Boise area Home? Junk Bros Can Help! Anyone living in southern Idaho knows that this winter was out of the norm! We just don’t get this kind of weather. Did your home take a beating due to heavy snow loads, or excess standing water and ice? It may be time for some light demolition and junk removal. If you’re anything like most people, there’s always something that’s “got to go”! Give your home’s exterior a good once over and see if everything is still structurally sound. Here are some items to be particularly aware of. The heavier than normal snow fall wreaked havoc on many Boise area porches. If you feel some sway in the support beams, it’s time to call in an expert. That’s a lot of weight over you and your loved ones’ heads. If it’s determined that you need to replace your existing porch, call the Junk Bros and let them remove the damage and haul it away. Your contractor will have a clean slate to work with. It’s also a smart thing to do to keep yourself out of legal trouble. Check out this article about injuries in your home! We see a lot of homemade shade structures. Pergolas, awnings, etc., that just aren’t meant to be lifetime additions. Look for holes in the fabric, nails coming loose from the crossmembers and such. Be careful on ladders if you need to get up off the ground. Many lawns are still soaked and could cause a significant hazard if a ladder gives way while you’re on it. If it needs to come down, let the Junk Bros take care of it. Check out our previous blog post about “the right equipment for the job”. Another reason to go with the pros. Deicing salts and chemicals can be hard on your concrete. 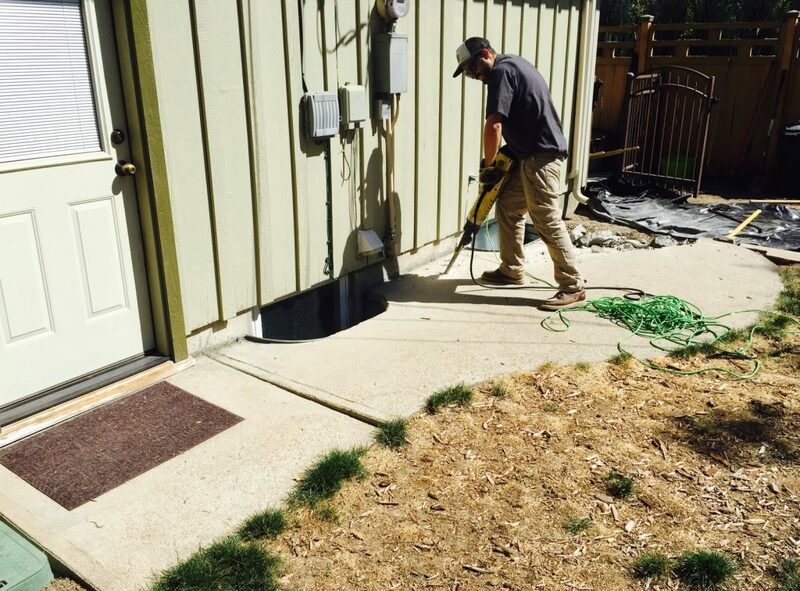 Whether it’s a patio, sidewalk or driveway, sometimes too much “prevention” will cause a need to replace sections of concrete. If you have new concrete, it can be especially frustrating. Here’s an older article called “How Cold Weather Affects New Concrete”…it’s worth a few minutes to check it out! At the end of the day, safety comes first. If you have damaged structures above your head or below your feet, someone could get hurt. Take some time to check it all out and let the Junk Bros team know if you need help. We’re always a phone call away!